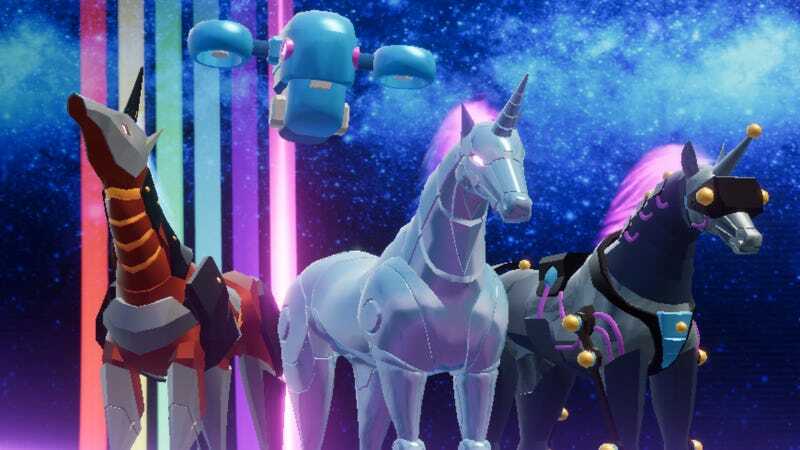 Since the release of the 2010 original, Adult Swim’s unicorn runner has been delighting players with fanciful flights over fantastic dreamscapes to the turn of Erasure’s “Always.” Robot Unicorn Attack Forever takes that base and builds a collectible robot gacha game on top. When you first start playing Robot Unicorn Attack Forever, available as a free download on iTunes and Google Play, it seems like just more of the same running, jumping, singing and swaying that fans of the series have been eating up over and over again over the past seven years. But at the end of that initial ride a massive unicorn-headed fortresses rises out of the clouds. Now we have a base of operations. We have a robot fairy guide named Lumina, who is all sorts of fun. We can assemble a stable of different robot unicorns, ready to be upgraded and fused into more powerful robot unicorns. We can forge new robot unicorns using currency earned in-game or purchased with real money. We can even assign our robot unicorns their own robot companions to aid them as they run across worlds dotted with massive robot bears. Is it a free-to-play game with microtranscations and a diabolical gache random unicorn delivery system that’s poison to the wallets of the unicorn-hungry masses? A little bit. Okay. Yeah, sure. But it’s also that game about a robot unicorn running through clouds to the music of Erasure. Plus it’s not too greedy, offering plenty of special events and ad-based opportunities to make a little extra unicorn-forging cash. In closing, life is indeed full of wonder.